Rachel writes: All club sessions are available this coming week, so plenty rowing opportunities. Have a lovely Easter weekend everyone, with temperatures up!! Rachel writes: We have a few issues this coming week. No evening rowing due to low water. We hope at the weekend – Easter Weekend – that the Marina can accommodate us for Saturday / Sunday mornings on a pontoon. Afternoons are good though, with plenty rowing opportunities. 10.15 — 0.5 m L. 16.30 — 6.1 m H. 22.38 — 0.2 m L Pontoon required. 10.53 — 0.5 m L 17.16 — 6.0 m H Pontoon required for morning training. Check out this amazing fundraising effort by five Ullapool rowers: Rowing the Minch for MS Click on the link to read all about it. The row will take place in August this year. 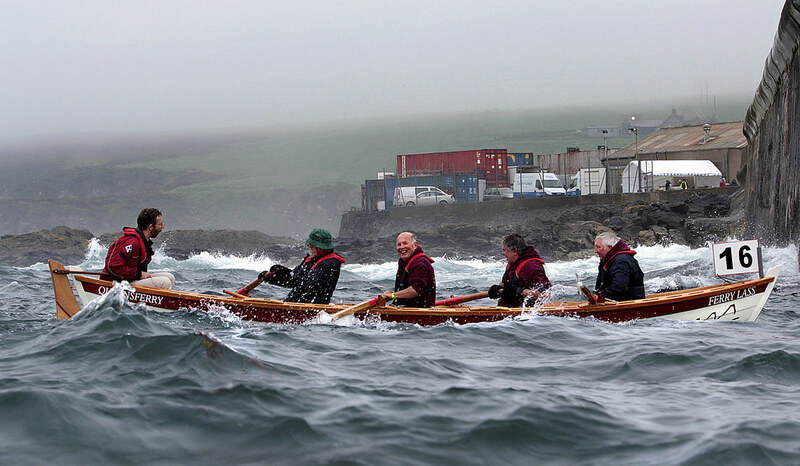 Our target amount of £22,683, equates to £1 for each stroke of our oars. Our challenge is to row the Minch from Stornoway, in the Outer Hebrides, to Ullapool on the north west coast of the Highlands, in a 22ft St Ayles skiff. The row, approximately 50 miles across open sea, is expected to take 15 hours. This is a personal challenge for the crew, the purpose of which is to raise awareness of Multiple Sclerosis and raise funds for the MS Society. The row, which will be physically and mentally challenging, symbolises the struggle of living with MS and is a fitting way to bring attention to a cause close to our hearts. A higher-than-average percentage of people in our small community have been diagnosed with MS, a condition affecting the brain and spinal cord for which there is currently no cure. Many more people care for those living with the condition. This row is our way of showing support: we see you, we recognise you, we care. The crew – Gary Lewis, John Grant, Kathryn Bennett, Lorraine Thomson and Anthony O’Flaherty – also have a Facebook page where you can see all the effort they’ve put in so far. 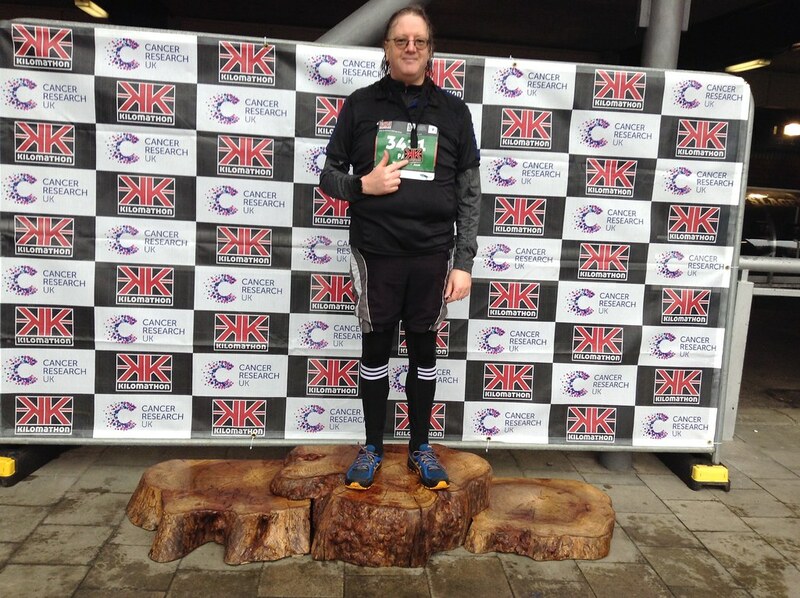 Paul Barbour, the brother of Sandy, a close friend of the late Andy Jarvis, ran the Edinburgh Kilomathon on Sunday 7 April in aid of Cancer Research UK in Andy’s memory. The link to Paul’s JustGiving page and his tribute was circulated to the club yesterday via email. As Keith remarked, “any club members who knew Andy will find a lump forming in their throats – especially if you were at the funeral”. Paul’s tribute is reproduced below. The greatest gift in life is to be blessed with a great family and special friends. People who light up your life every day. Andy was my brother Sandy’s best friend, in fact they were a group of lads all best friends, Andy, Danny, Tom, Jock and Sandy. They went through school together and they grew up together meshed in the cogs of friendship. As the years went on they would often meet up for a few beers and a catch-up. That’s the special thing about friends, they can be apart for years but when they meet again, it is as if they have just wandered from one room to another. I first met Andy when I was a kid, I would often follow my older brother up to the playing fields just so I could join in with their game of football. By that time they were young men on leave, Danny was in the Para’s, Sandy in the RFA, Jock was in the army and Andy worked as an engineer on the fishing boats. Andy had a smile that lasted every minute of his life, he was a warm kind person who genuinely wanted to listen to what you had to say. You never found him any different. He was just one of life’s special gifts. My thoughts go out to Anne his lovely wife and his kids Lynne and Andrew as I write this. I remember Jock and as a small boy I use to hang around with his nephew at school and I remember we dug a hole in Jocks garden trying to get to Australia, the hole was huge, he was a quiet man who I know was loved dearly by them all and lost his own fight with cancer. One of the greatest tributes I have seen to mark a friendship is a rock that sits in the cairn on top of Buachaille Etive Mor, a Scottish mountain. It’s a decent size rock with Jock’s name inscribed into it. 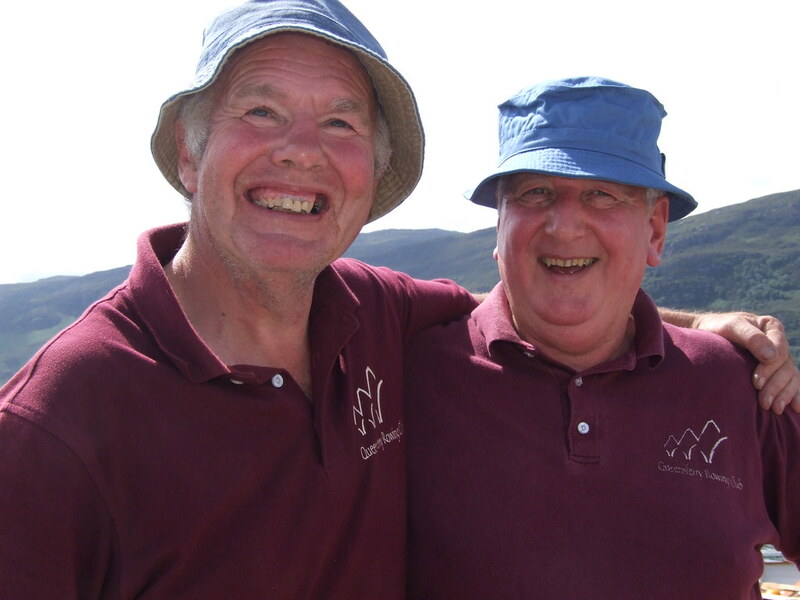 Danny climbed up that difficult mountain carrying that load on his back in memory of his dear friend Jock. That was the calibre of bond that existed between these lads. Danny and Andy were neighbours living doors away from each other, I know that Andy had a special part in Danny’s poetic heart, a lifetime companion and another big cog dropped out of his life when Andy had gone. If you are lucky, life is a long walk through many years and to carry an amazing friendship is to also carry the burden of its loss but its memories will partner you for the remainder of your own journey and for every step you take those memories are priceless. Andy and Tom frequented the same bar almost every Saturday for a few beers and a catch up and it was the one place we all knew we could find them and I could update Andy on my life and listen to his joyful spirit emanating out of him akin to the true spirit of Xmas. I often think of Tom and the loss of his Saturday companion, they had a special bond. My brother lives on his own, Andy who lived in the same town would often pop around to pull Sandy out of his hermit hole. He would also mend things for Sandy around the house. They would even occasionally set sail together in Andy’s boat. Sandy equally would pop down to Andy’s. They would often meet up and get the train through to Kirkcaldy to meet Tam and Danny. The circle of lifetime friends and time ticking away transparently. It seemed fitting that Andy’s hobby was escaping to his garden shed and making garden gnomes that shared his sunny smile. I reckon there was a bit of magic in how they got that smile. In the end Andy succumbed to cancer and those remaining lads after a lifetime of friendship shared their last farewell together. I think of his smile often,I think of him in my mum and dads back garden smiling. I remember the first time I sang in public and Andy’s kind words and his comments that I was a dark horse and yes he was smiling. I think of him when I have done the black rock race in Kinghorn and often been met by his smile afterwards, i would occasionally meet that smile when I was out running and Andy was out cycling. I think of that smile when I watch the old home movies those crazy loonies made in the 70’s as young men enjoying life. I can honestly say the last time I saw Andy in the worst circumstances that I knew it was the last time I would see that smile from the warmest soul you could meet. At his funeral he requested for the song ‘row row your boat’ to be sang, that was Andy, a lifetime of smiles to be spread amongst the congregation. Living in Dalgety Bay I often run by the coast and looking out to sea I always think about Andy rowing up the Forth, with that tune merrily, merrily, merrily, merrily in my head. I am ironically not known for smiling but on the 7th April I will make sure I do, in memory of Andy. Finally I also want to mention the amazing response from the Queensferry Rowing Club members, upon visiting their own amazing tribute to Andy on their website are two reminders of the love for him. 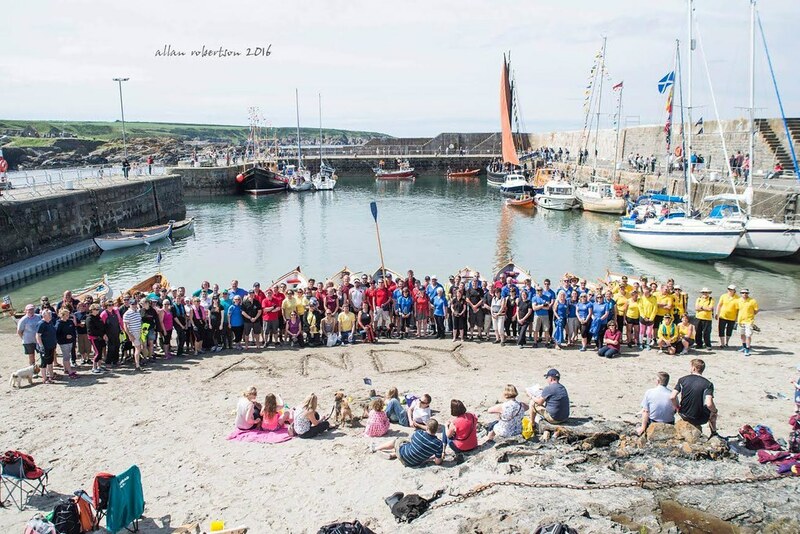 The many rowers who stood outside the crematorium and saluted Andy with their oars and the great picture of his fellow rowers and friends assembled on the beach they simply engraved in the sand ‘Andy’. First of all, thanks for all the very generous donations. I am privileged to have had the opportunity to make a tribute to Andy. We are all aware how much he was loved by his friends and family and I knew Andy through Sandy’s circle of great friends. However, he was as I described in my fundraising and anyone would recognise Andy in those words, a lovely chap who deserved to have longer. When I was recovering from my heart operation I went out with Sandy and Andy, Andy was in the middle of his own situation and I remember feeling great guilt then knowing that my outcome was looking positive and the his own was not looking so good. I just wanted to give him a big hug and make him better. When I got the chance to run the Edinburgh Kilomathon as my first medal race since my own operation I spoke to Sandy about the charity and how I wanted to make it in memory of Andy. He was one of Sandy’s best mates and I felt a bit awkward about it. I often think about him whilst out on my coastal run and his love for his family, life, the sea and cycling and most of all just being everyone’s friendly ear. I would occasionally meet Andy on the cycle path or around Kinghorn, he would be heading out to his boat club or just out for exercise. So thank you all again for contributing to the memory of Andy. The race event is over but the tribute will remain every time I see the sea and make my way along the coastal path to simply one of a kind, a great man. My race time was 1:24:11 which put me on 10:38 miles so a lot closer to my old running times. The recovery to running has been a difficult one but I am just happy to be able to still compete against myself. Click here for Paul’s JustGiving page. Click here for more photos of Andy. Rachel writes: Next week’s tides suit us well for our social sessions. We can now start evening social sessions, so please come along at 6pm on Tuesdays and Thursdays. The tides won’t suit every week, but make the best of the evenings when the tides are in our favour! Spring is here!! The aircraft carrier Queen Elizabeth needed the help of several tugs in today’s windy conditions – our 60+ training crews stayed inside the breakwaters. 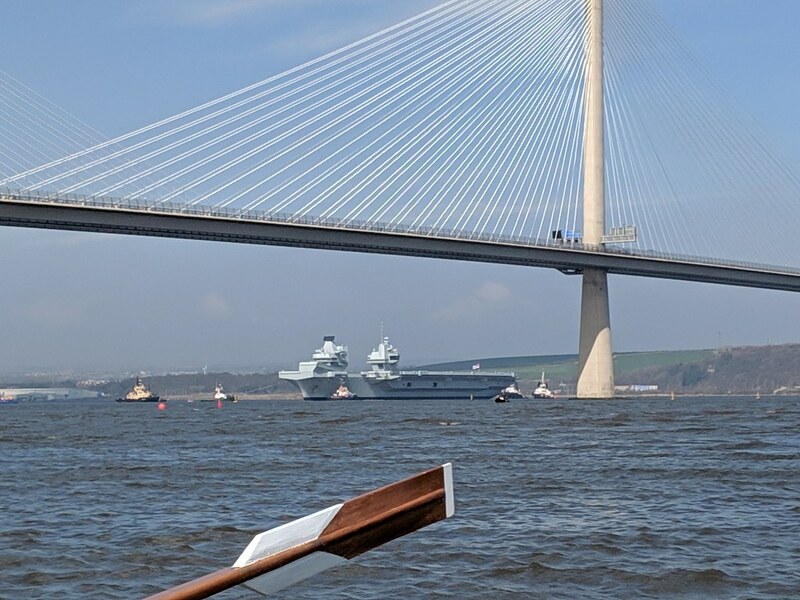 Our Facebook group is the private page for Queensferry Rowing Club members and those invited to the page.